Riv. 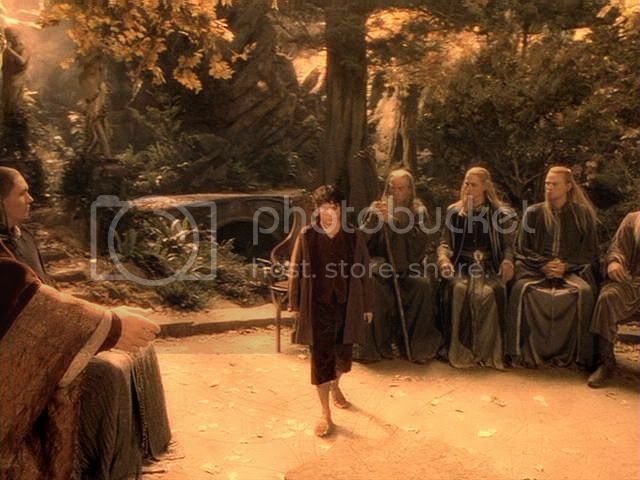 7 ~ Council of Elrond 1: ‘Bring Forth the Ring, Frodo’, plus "Rivendell Suite 4". Note: Long opening post with lots of pictures and text. My apologies to dial-up users. 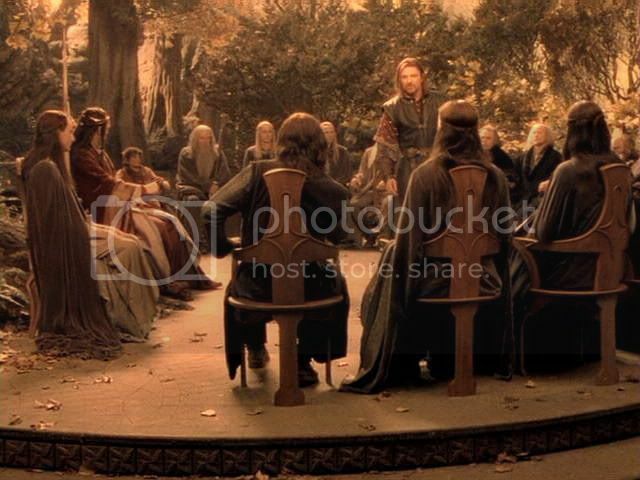 Here begins a five-part presentation of the Council of Elrond. The filmmakers said they worked long and hard trying to make the extended historical accounts that fill this chapter into an interesting film scene. I think they succeeded. They greatly condensed what is a rich, complex collection of tales, and created a scene that tells the story the film needed to tell, establishing key plot points and crucial inter-character dynamics. The pacing of the scene flows, but slows down where it needs to, stopping for crucial beats underscoring dramatic impact. 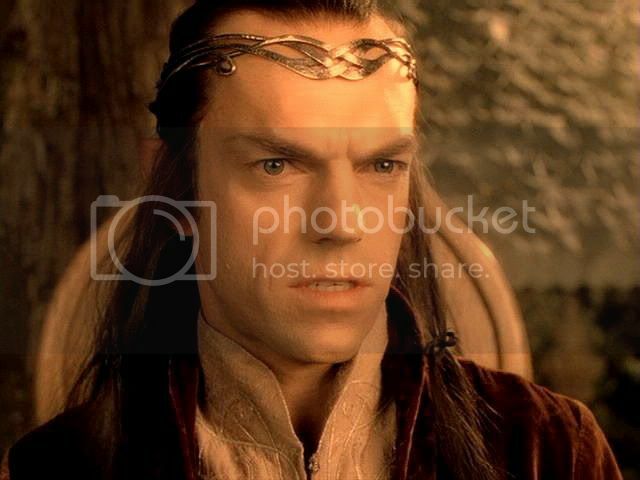 Almost all of the film dialogue comes from The Council of Elrond, which ends with Elrond’s response to Frodo’s offer to take the Ring to Mordor. Additional dialogue comes from the chapter that follows, The Ring Goes South. But the ordering of the dialogue elements is different. I trimmed a great deal from the book chapter in order to relate the material to the caps, but unless I pulled the book’s sequence to pieces, I could not get the book excerpts to match the screenplay. I was not willing to do that. Still, it’s nice to be able to read the book text while following the film scene, even if it doesn’t always match. The images from the film are wonderfully evocative. For me it’s better still when I can ‘flesh out’ the film scene with what Tolkien wrote. I see and hear the hush in the room; the hairs on my head lift from the suspense as all eyes turn to film-Frodo. 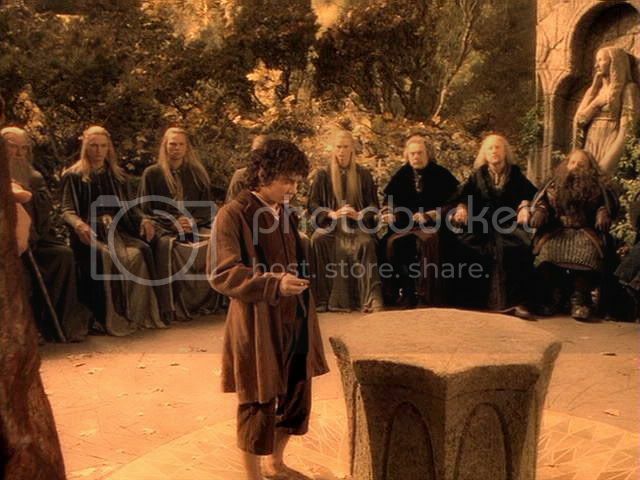 I see the Ring gleam as he draws it forth and places it on the stone pedestal. And I see Frodo’s reluctance to rise and step into the spotlight, obviously wishing he were anywhere else. But I do not see his reluctance as ‘a great reluctance to reveal the Ring’. I do not see ‘a loathing of its touch’. 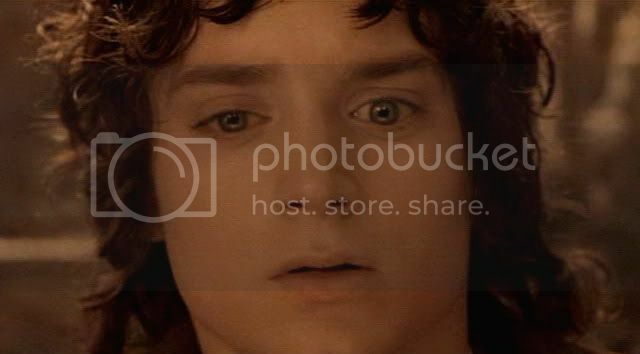 Nor do I see Frodo ‘shaken by a sudden shame and fear’. 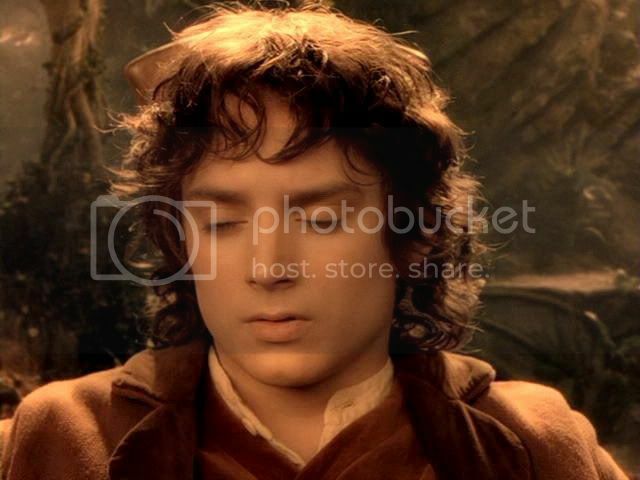 This is not necessarily a fault, since the filmmakers (and Frodo’s actor) dramatize these feelings elsewhere in the trilogy. But by reading the book text while looking at the caps, I find myself imaginatively completing, or filling in, what I didn’t see on screen. That’s one of the things I’ve come to love about making these posts. It is a way, if a small way, to have my cake and eat it too. I can revel in the dramatization provided in the trilogy, with its unforgettable portrayals, wonderfully imagined visuals and powerful musical score, but let the experience be deepened by the book’s rich text. I hope you find enjoyment in this series, too. Jan-u-wine has written a fourth installment of her Rivendell Suite for this first set of caps, but also with the book in mind, opened up by her own imagination. 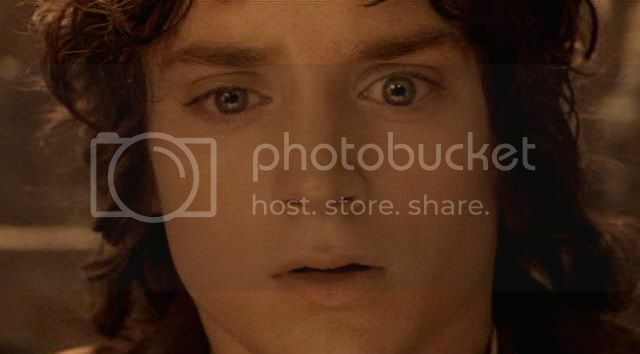 I have always wanted to experience this scene from Frodo's point of view at a deeper, more intimate level. Jan has made that wonderfully possible. I think it is magnificent. The poem appears after the last caps. 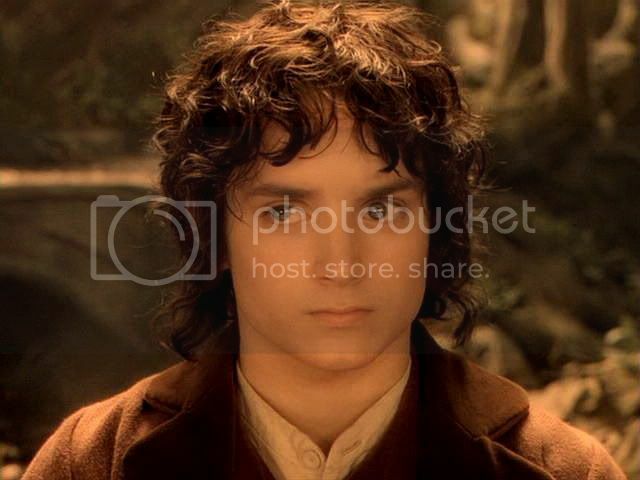 Frodo and Bilbo followed the wizard quickly along the winding path back to the house; behind them, uninvited and for the moment forgotten, trotted Sam. Gandalf led them to the porch where Frodo had found his friends the evening before. The light of the clear autumn morning was now glowing in the valley. The noise of bubbling waters came up from the foaming river-bed. Birds were singing, and a wholesome peace lay on the land. To Frodo his dangerous flight, and the rumours of the darkness growing in the world outside, already seemed only the memories of a troubled dream; but the faces that were turned to meet them as they entered were grave. 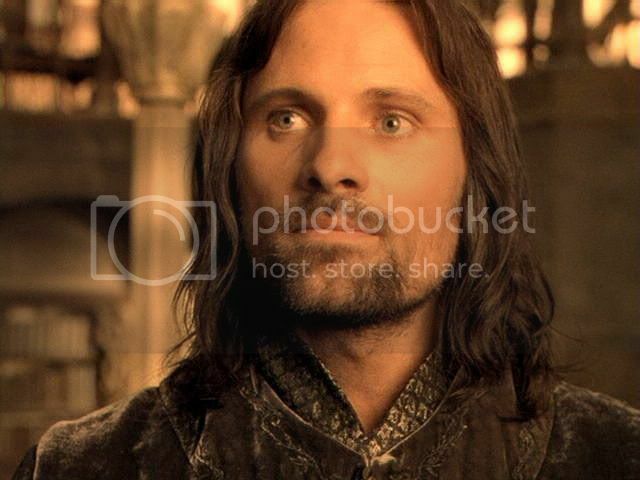 ‘And here in the house of Elrond more shall be made clear to you,’ said Aragorn, standing up. 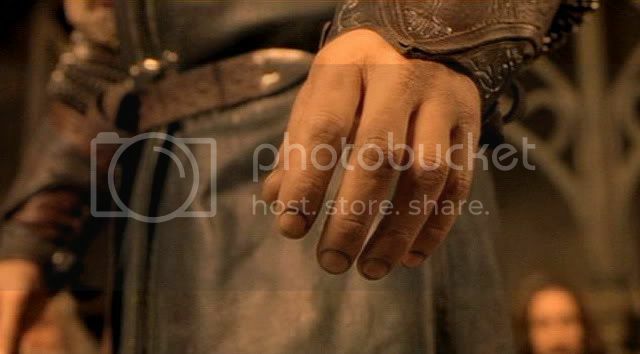 He cast his sword upon the table that stood before Elrond, and the blade was in two pieces. ‘Here is the Sword that was Broken!’ he said. ‘And who are you, and what have you to do with Minas Tirith?’ asked Boromir, looking in wonder at the lean face of the Ranger in the weather-stained cloak. 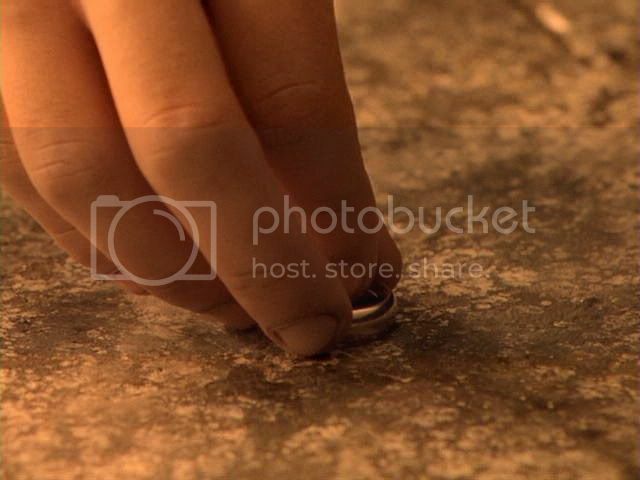 ‘Then it belongs to you, and not to me at all!’ cried Frodo in amazement, springing to his feet, as if he expected the Ring to be demanded at once. 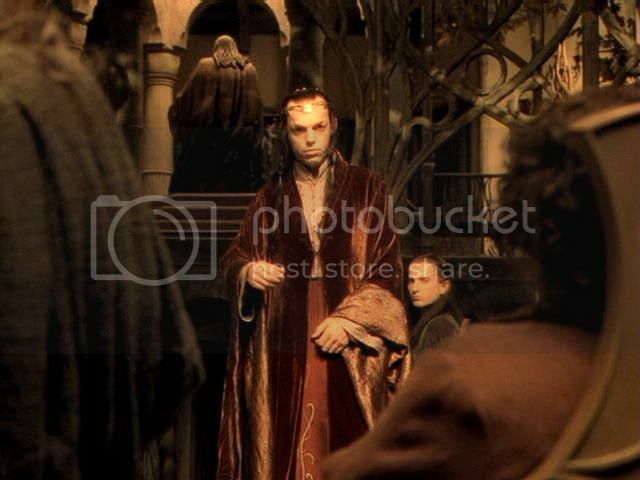 Elrond: Strangers from distant lands, friends of old, you have been summoned to answer the threat of Mordor. Middle-earth stands upon the brink of destruction. None can escape it. You will unite, or you will fall. Each race is bound this fate, this one doom. 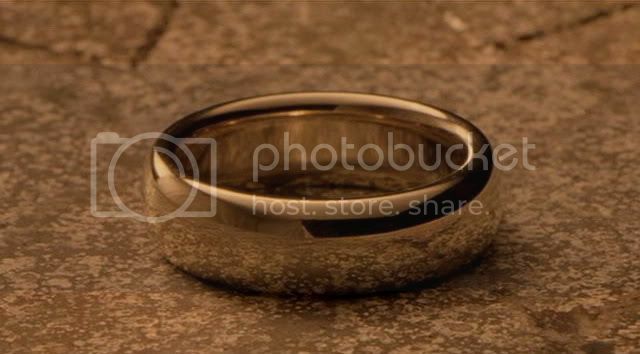 Bring forth the Ring, Frodo. 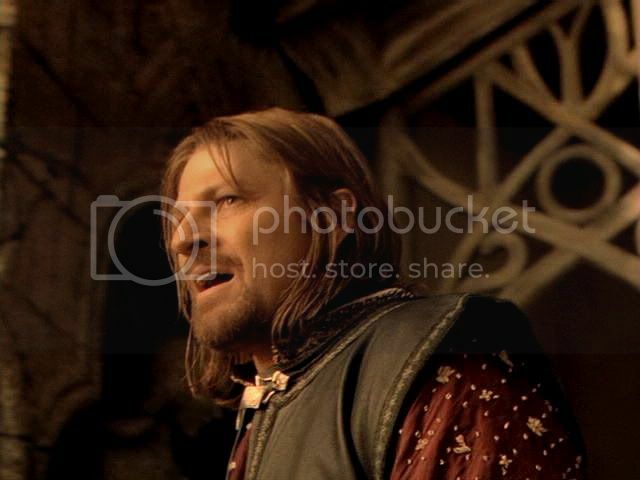 Boromir: So it is true…. Note: The screencaps for this series are all taken from the fullscreen edition of the theatrical version, except for the set for the EE extended addition (below). The EE edition only comes in widescreen, so I trimmed off the sides of the frames to make them the same width as the fullscreen caps. The widescreen caps are, however, less high. As usual, all the screencaps have been adjusted for brightness, contrast and focus. Boromir: In a dream, I saw the eastern sky grow dark. But in the West a pale light lingered. A voice was crying: "Your doom is near at hand. Isildur's Bane is found. Isildur's Bane…. Elrond: Leaping up before Boromir can touch the Ring:Boromir! Elrond: Never before has any voice uttered the words of that tongue here in Imladris. 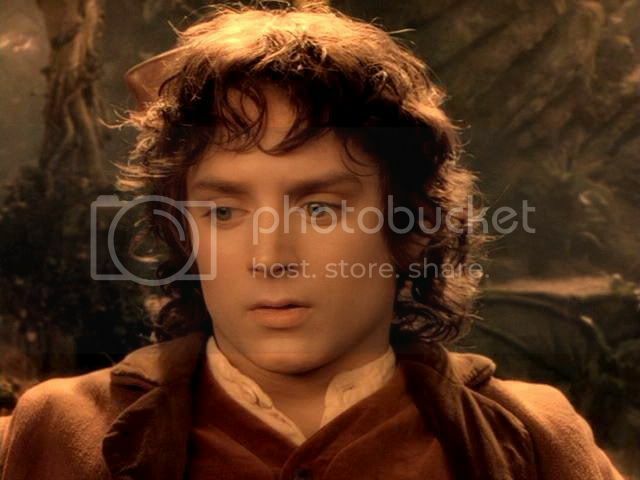 Gandalf: Recovering himself: I do not ask your pardon, Master Elrond, for the Black Speech of Mordor may yet be heard in every corner of the West. The Ring is altogether evil. Boromir: It is a gift. A gift to the foes of Mordor. Boromir rises to address the group. Why not use this Ring? Long has my father, the Steward of Gondor, kept the forces of Mordor at bay. By the blood of our people are your lands kept safe. Give Gondor the weapon of the enemy. Let us use it against him! You cannot wield it. None of us can. The One Ring answers to Sauron alone. It has no other master. And what would a Ranger know of this matter? this gathering of the mighty and the wise. blood-kin to the Seven Fathers. He is calling for It. The sweet-dark touch of Its whisper falls upon my ear. It to the gaze of these others. stripping me of all but horror. the forging of my fate captured between them. the mouth which utters them. within this glade of autumn. the Sun warm and winking in Her place. still, in this haven of the Eldar. the amber of these spell-woven gates. He that my Lord well-named speaks. ~ Riv. 8 – ‘Never trust an Elf! ', plus jan-u-wine’s 'Rivendell Suite 5’. It's wonderful to see this scene "up close", and Jan's poem is full of Frodco's tumbling, conflicting, doom- and hope-filled emotions. I found this all very interesting as it is such an emotional scene to capture. The dialogue works without being wordy and Elijah's range of expressions are actually best seen in caps. Yes, they did a great job paring down the dialogue to just the bits that needed to be there for the scene to work. I didn't always love their adaptation work, but I think they did really well by a very intimidating (to put on film) scene. Just responding to the first part thus far, and what a treat to have this today for the holiday--thank you, mechtild! 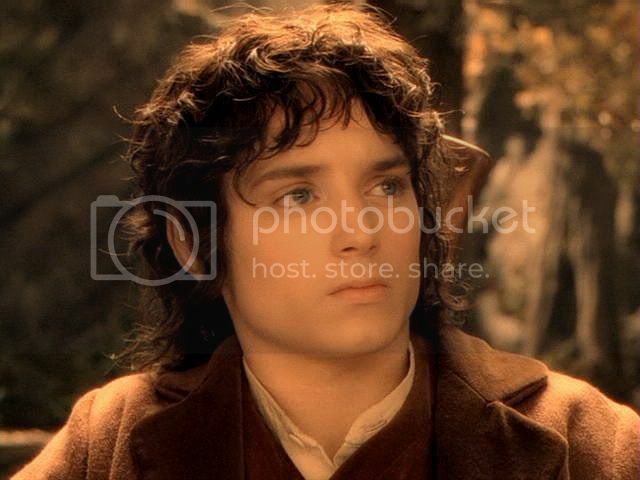 I do see fear and reluctance on Frodo's face and in his carriage as he walks to the pedestal, but no shame. I see reluctance and deliberation as he puts the ring down. 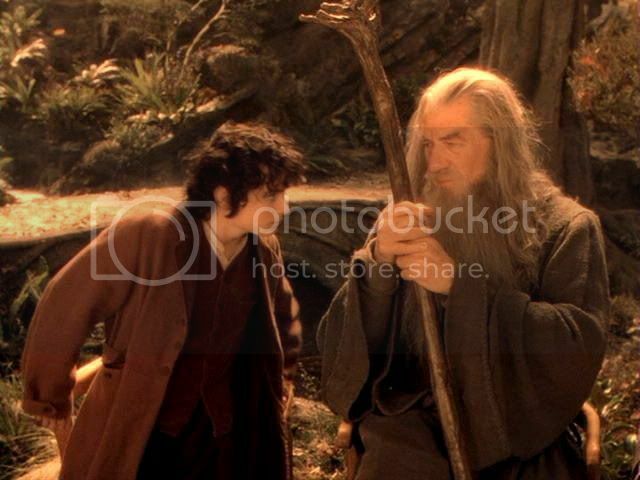 I hadn't seen before the way he looks at Gandalf until these stills--whoah! 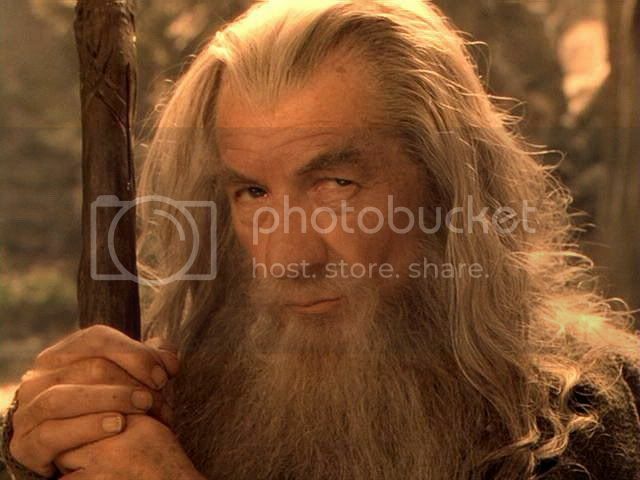 Watching the film in motion, I thought he was looking at Gandalf for approval: Did I do it properly?" But in those stills he looks pissed off as hell--"Fine, I did it and left it there. Are you satisfied?" Then his looks in succession are stress and regret, re-centering and resignation, then relief and pleasure at release. Quite a sequence Lij took us through! It's a very satisfying sequence to look at in caps, I agree. 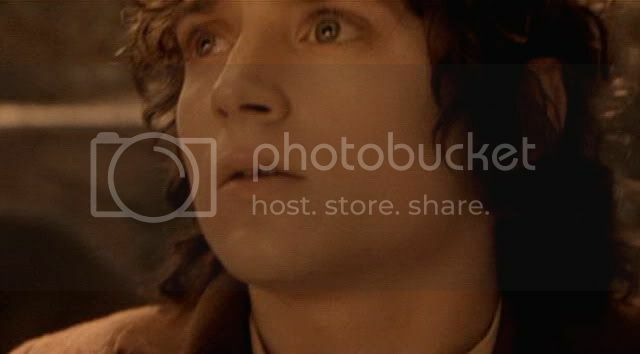 Frodo's look at Gandalf surprised me, too. But when the film is rolling, he doesn't look angry, just flogged, having done what was asked -- an almost sulky, sullen dropping into his seat, but it passes almost instantly. Yes, that's all I saw in passing, but in those frames you could cut a knife through the angry looking tension he's directing toward Gandalf and Gandalf's scrutiny of him. 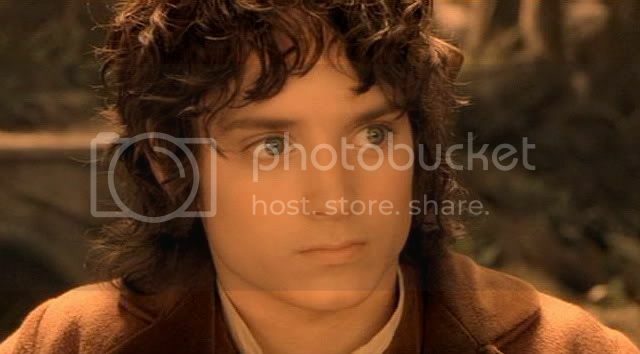 This scene is the one place in which the film adaptation's more timid Frodo is much more fiercely brave than Frodo of the book, and so maybe Lij translated the book's shame into resentment. Plus his nose looks so rounded in the first frame of sitting back down--a whole different shape. I remember when first watching the film I was struck by how wholly different his features could look from frame to frame. That looks like a whole different nose from that angle. his nose looks so rounded in the first frame of sitting back down--a whole different shape. I never even noticed, but you are right, Lavender. Fascinating. I wonder how that effect could have been achieved? The frame isn't blurred, yet that is simply not his profile. It's interesting how different his face could look in various parts of the film, I agree. I think the main difference, for me, depends on whether he is shot from above (typical tall person perspective) or below (e.g. 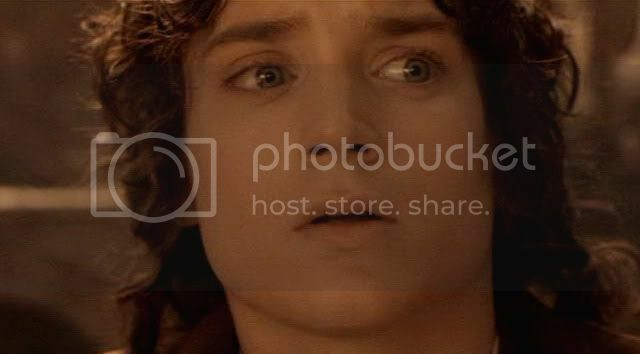 in the midst of attacking Sam or Gollum, or in the opening: looking down at Gandalf as he passes in the cart below, Frodo standing, arms folded, on the grassy bank). His face looks really different in these shots, not just his expression. I suppose it's gravity draws the fleshy parts of the face either backwards or forwards. The poem is lovely--I love how Jan puts the scholar Frodo of the book back into Frodo of the film. Frodo's scholarship and language skill is one of the changes from the book that I really miss in the film adaptation, so I thank her for this. The film does a magnificent job of sorting through the book's info dump and rearranging it dramatically by giving us pieces of that info dump in the prologue and in Gandalf's earlier scenes, thus distilling this scene into interactions that define the members of the fellowship. 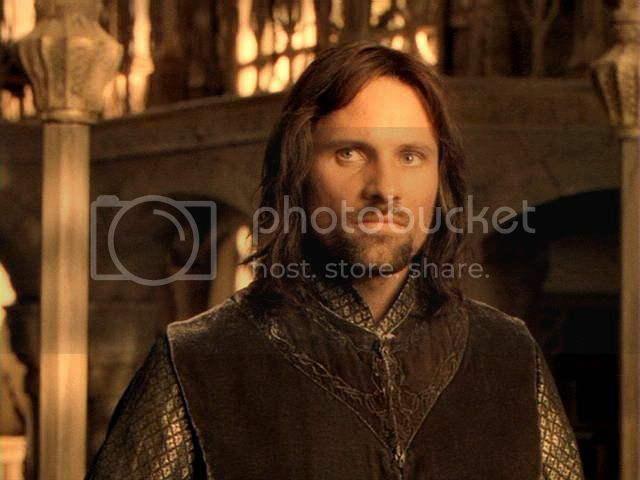 The scene also creates a bond between Legolas and Aragorn that doesn't exist in the book, but I think serves to help Legolas become more than the token elf I find him to be in the book. PJ/FW/PB did an amazing job with the screenplay of the first film and this is one of the scenes in which their adaptation work really shines for me. The film does a magnificent job of sorting through the book's info dump (...) distilling this scene into interactions that define the members of the fellowship. The scene also creates a bond between Legolas and Aragorn that doesn't exist in the book, but I think serves to help Legolas become more than the token elf I find him to be in the book. He is sort of a token elf in the book. It's not until they get to Lorien and he tells/chants/sings the tale of Nimrodel that I really begin to get a feel for Legolas, his conversation with Gimli about dreams and memory, etc. Just as Gimli doesn't become more than token dwarf for me until he chants/sings the Khazad-dum poem. 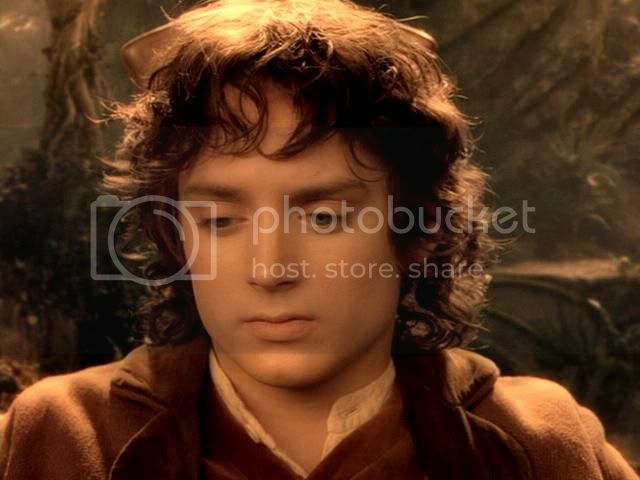 Some readers just skip over the poems when they get to them, but I think the poems the characters recite (like Aragorn reciting the Lay of Luthien, Sam his poems, Frodo his, the cousins theirs, Treebeard his, Bilbo his Earendil poem as well as his homelier poems). Because the poems matter enough to the characters to know them and recite them (and even write them), the poems are very character revealing, if in an indirect way. Thanks for this comment, Lavender. I don't like reading the verses in LotR so much--just read, they fall flat for me as poetry. They're much better as songs, and read so much better when set to music--not all poetry needs to be set to music, but I think JRR's does--for me at least. When I was a teen and had just read LotR, I found that the town library had a copy of the LP of JRR singing some of the poems, and took it out to listen to many times. I only enjoy the poems if I have time to apply a tune to them in my head as I read them. I agree about them being better as songs, but in almost every case they were designed to be sung. Tolkien's alliterative verse, none or little of which shows up in LOTR, is very beautiful as spoken poetry. I would have to disagree about the Khazad-dum poem in LOTR, though. On the BBC radio version of the trilogy, Gimli recites it does it so well (and the actor so in character), I find it a fully fully involving piece merely spoken. I have yet to listen to the BBC version, so more treats await me. Now I can catch up on your breathtaking entries. BTW, I have more Bingo Doll Adventures up, which is why I've been absent--and a couple more episodes will be coming in the next week. The BBC production has some real clinker moments in it (the people who like it love laughing and rolling their eyes together over them), but it has much to recommend it. Bill Nighy's Sam really opened my eyes to the character for me. I felt like I hadn't been reading with real attention all these years. 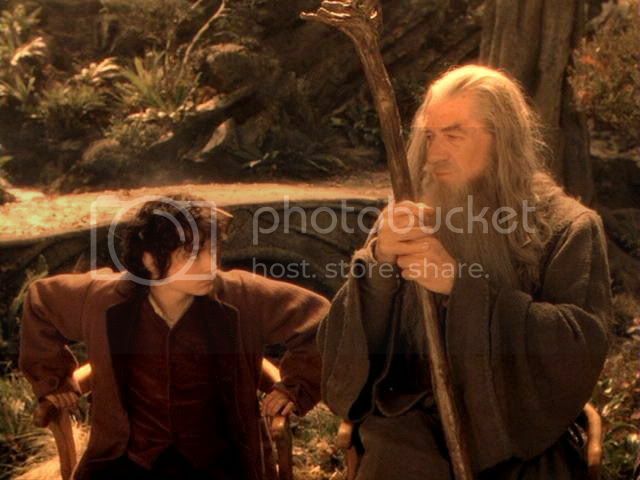 Ian Holm's Bilbo took some getting used to, having watched Elijah do it fifty times. But while EW has got Frodo's "Elvish" side down, Ian Holm makes him incredibly human, the hobbit who stands for the English men, not soldiers, often well-educated and sensitive-souled, who nevertheless went to war in WWI. At first he seemed over the top to me in his performance. Another fan told me to bear in mind that Ian Holm was acting the role to be heard, not seen. Just as EW had to bring book Frodo's unexpressed thoughts and feelings to the surface for viewers visually, using mostly his face and eyes, Ian Holm, for radio listeners, had to bring all that unexpressed feeling to the surface using only his voice. Having the books, having the films, having the soundtracks, it's hard to make time for the radio play, but I do have it and will get to it. I link the first episode of this adventure on my LJ here. I was really happy with the compositions of some of the frames and thought of you on those ones. The second will go up sometime this weekend. How very interesting to have this scene anatomised like this. Elijah had to do a lot of acting here, despite having virtually no dialogue! Thanks for this, and also to Jan for yet another fabulous and insightful poem. Yes, he did have a lot to do. I think that was one of the hallmarks of his acting in the role, the way he played the non-speaking side of scenes. He was always 110% present in every scene, never just holding up the wall waiting for "his turn". 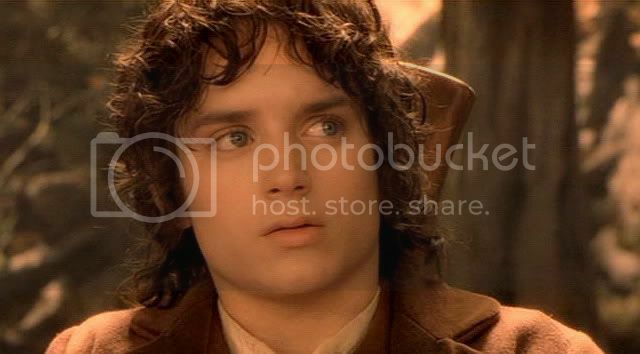 But it's sort of built in, with everything geared to not only tell the story in general but to work Frodo up to the point that he feels compelled to volunteer. Lovely words, Mews. Yes, that light you have pointed out since Riv. Pt. 1 is still there, the light as of the golden age, but a passing age. And you're right about Frodo's hope in Aragorn. 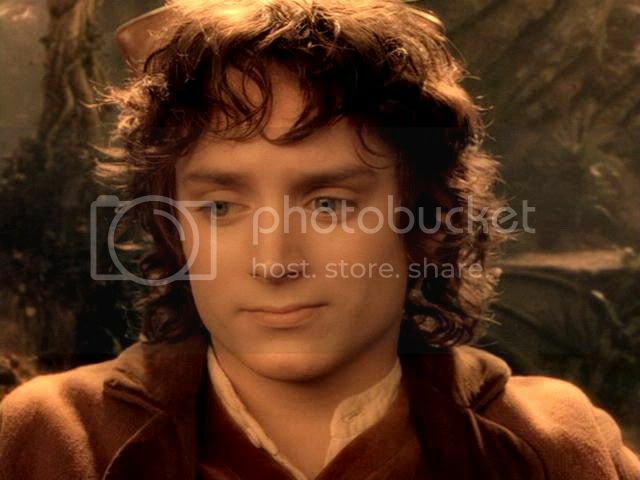 As Frodo tells Aragorn with relieved joy, when Aragorn says would it would suit Frodo if he came, too (in an excerpt that won't appear until a later post), "I would have *begged* you to come!" I love being able to savour these screencaps, especially the close-ups, which pass too quickly in the film to absorb all the information that's there. 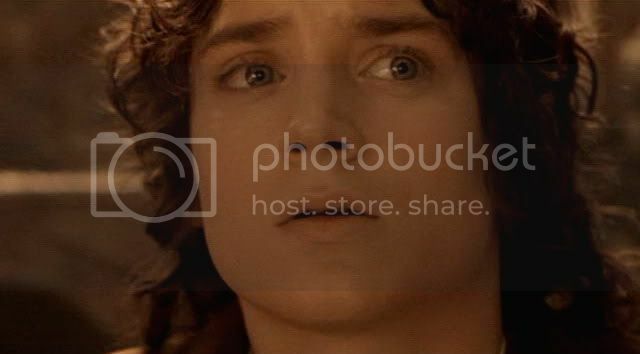 I am particularly impressed by the last cap in the first series where the right side(as you see it)of Frodo's face shows relief, the left, sadness. 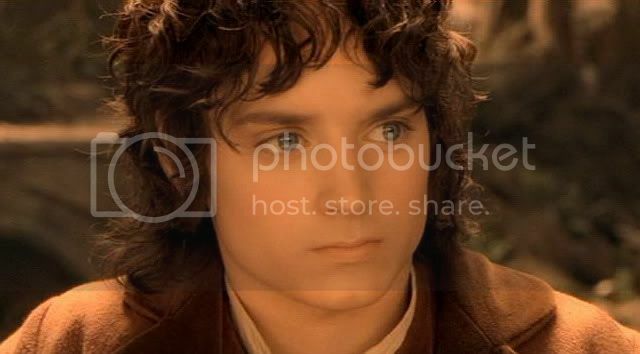 I am particularly impressed by the last cap in the first series where the right side(as you see it)of Frodo's face shows relief, the left, sadness. You know, I never noticed that, Brummie. That is so cool! The two sides really are that different. Yes, it's great to be able to "slow down" the scenes. There is some distortion, taking frames and looking at them out of context, but there's always so much visual food for thought, looking at the scenes this way. Thanks for commenting. Thank you Mechling. Thank you Jan. I'm so glad you enjoyed it all, Estë! I do, too, Paulie, but I never noticed (as was pointed out by Earth's Daughter/Brummie above), that one side of his face is a little sad, even as the other side is smiling. A trick of the light?